Extra! Extra! Read all about it! Kama Ayurveda has launched yet another value for money soap in the market. None of us are new to the brand Kama Ayurveda. We all know them and their spectacular range of products that they have to offer. I have tried a couple of their products earlier and have loved and recommended most of them. Though I am not a huge fan of soaps but trust me when I say this I have a new found love for Ayurvedic soaps all thanks to Kama Ayurveda. I had completely stopped using soaps for the last 5-6 years but this new kid on the block really did tempt me to reconsider. Now since I have been talking highly about this soap for so long must have got you really tempted so lets know this product a little more in detail. 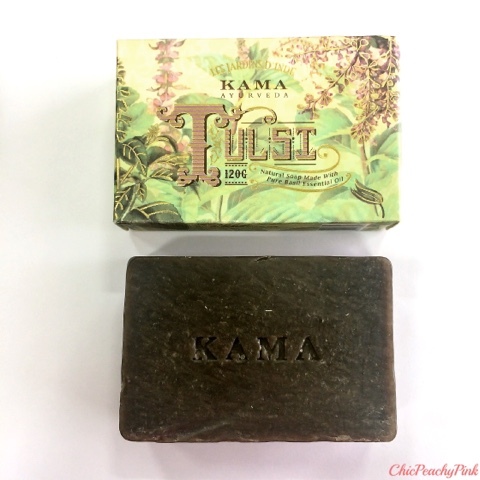 Since Tulsi Soap is a new launch by Kama Ayurveda. Product will ​exclusively ​be available online from 21st August to 31st August on their website www.kamaayurveda.com as a part of online promotion and will be available across all stores from 1st Sept onwards. So if you would like to order this fabulous product after reading my review then you can click HERE. 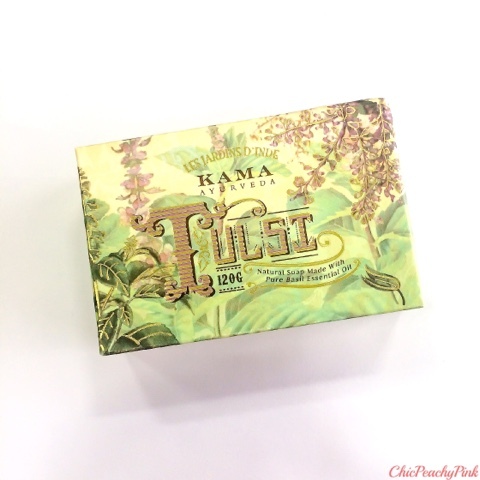 Claims: Kama Ayurveda's Natural Tulsi soap is an ideal blend of Basil Essential Oil, Extra Virgin Organic Coconut Oil, Castor Oil and Bees Wax. Basil essential oil enhances the luster of dull looking skin. It is also commonly used to treat acne and other skin infections. Extra Virgin Organic Coconut oil is rich in fiber, vitamins and minerals, which helps relieve dryness, removes dead skin cells and has natural antioxidants that delay ageing. Beeswax contains Vitamin A, which softens and hydrates dry skin. Castor oil is absorbed easily in the skin and works as an excellent moisturizer. Being a natural handmade product there is bound to be variations in scent, shape and colour. 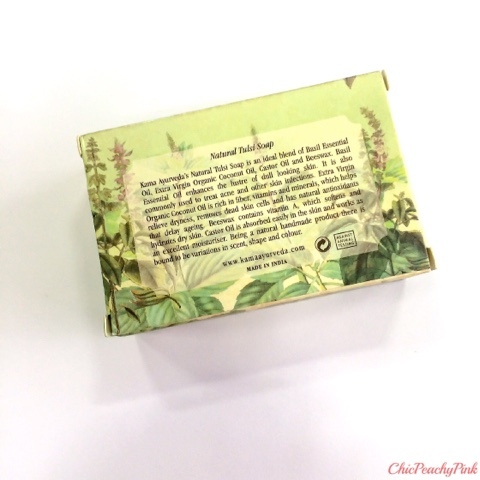 Packaging: The product arrived in a sturdy paper box with Tulsi written in bold words on it. The packaging of the product looked quite decent to me. Even the actual product within the box had butter paper on it which I found was very hygiene friendly. Being a Tulsi soap I had expected it to be some shade of green and it was indeed perfect basil green in color. 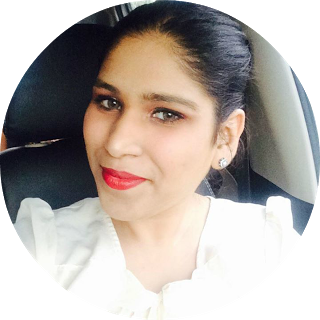 Scent: I have always noticed ayurvedic products are very strong scented. This particular soap also has a very strong sweet Basil scent. I love the scent of this soap, it gives me the feel of an aromatherapy product. If you are a person who likes mild scented products than this would not be an ideal pick for you. However, if you can get past it it is one hell of a product. Texture: The soap glides on smoothly and I love the way it lathers. I have really dry legs and usually I feel very uncomfortable after a bath but when I used this product it hydrated my dry legs really well and made me feel comfortable. Though you would still need a moisturizer after your shower but your skin wouldn't feel irritated. The feature that I liked the most of this product is that it is paraben free, organic, all natural and has a list of remarkable ingredients in it. Disclaimer: Though this product is sent by the brand for consideration my opinion stays honest to the best of my knowledge. Hope you liked this post. Also do let me know in the comments section below if have you tried any of the soaps by Kama Ayurveda? Thank You for this !! I love Kama Ayurveda anyway but now I am gonna try this one for sure !! Nice post! Have a lovely day! Seems like a great product, nicely reviewed dear! This was new for me and I thank you for sharing! 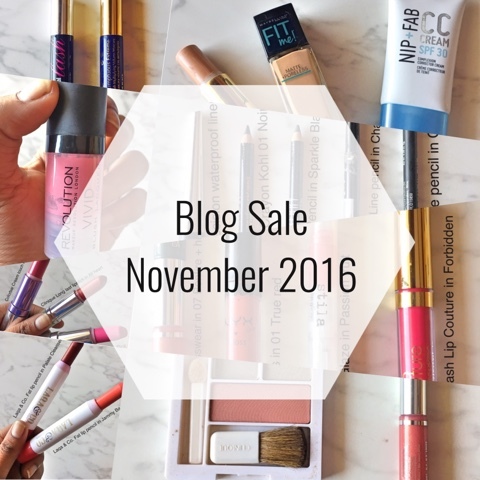 I need to check them out because I love Ayurvedic beauty products! This soap sounds really lovely and I love the packaging as well. All the goodness of Tulsi in an easy to use soap bar. This sounds very interesting. I have tried a couple of Kama Ayurveda products and I love them. I am loving this right now! LOOOOVEE the fragrance ! Looks like a nice paraben free soap, I would love to try it.